The violence and bigotry displayed in Charlottesville last weekend reminds us of the challenges that racial hatred poses to democracy. In August 1965, President Lyndon B. Johnson addressed one aspect of this by signing the Voting Rights Act to safeguard the voting rights of African Americans. Yet, decades of efforts to deny the vote highlight the tensions between just and unjust laws. Looking to this history is a reminder that challenges to voting rights are a perennial feature of political life in the United States, past and present. This is becoming evident today as controversial accusations of voter fraud are brought to the forefront under the Trump Administration. 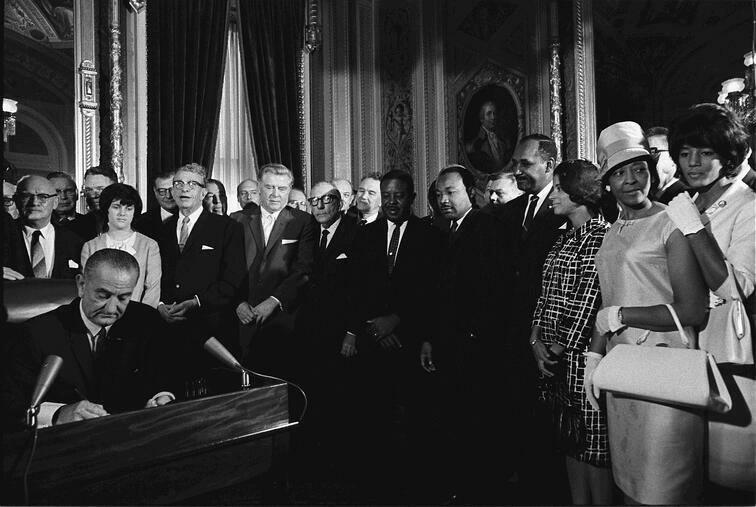 A century before President Johnson signed the Voting Rights Act, the US inaugurated efforts to expand voting rights to people of color and women through multiple constitutional amendments. Yet, restrictions to voting continued to emerge in the form of literacy tests and voter intimidation. The Voting Rights Act eliminated those barriers and required southern states with histories of racially motivated disenfranchisement to submit any proposed changes to the federal government. This has not stopped states from attempting to bypass the Act through legislative action, often claiming to protect the integrity of this institution. In 2013, the Supreme Court ruled that southern states no longer needed federal approval for changing voting procedures. This brought about laws limiting early voting and registration, some requiring voters to present identification at precincts. These laws have disproportionately impacted the ability of poor and minority voters to participate in the democratic processes in spite of their eligibility. They have also set the stage for President Trump’s repeated claims that between 3 million and 5 million illegal votes caused him to lose the popular vote in the 2016 US presidential election. These claims, made without evidence, sparked the launch of the Presidential Commission on Election Integrity to investigate the issue in May. The commission has requested full voter-roll data from all 50 states. To many, this inquiry appears to be part of a new wave of voter suppression taking shape in the 21st century. Teachers can use the history of the Voting Rights Act as an entry point to discuss the troubled legacy of voting rights today. It can help students grapple with questions of who has the power to influence society and what it means when a community is barred from participation based on race. Ask your students to think critically about the tension between inclusion and exclusion in U.S. history. Let them consider the relevance of the Voting Rights Act in both the history of disenfranchisement and contemporary concerns over voter fraud influencing today’s environment. Understanding this history can help students appreciate that in a democratic society voting is one of the most visible signs of the rights and responsibilities of citizenship. It allows students to have a reckoning with the injustices of yesterday and their legacy on tumultuous social conditions today while serving as a reminder that gaining and maintaining rights is an ongoing effort. Explore resources on what it was like to vote in the south before the 1965 Voting Rights Act with resources from our Boston Public Schools Civil Rights Curriculum.